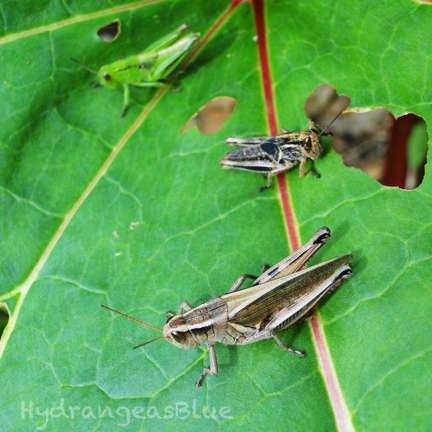 I have millions of grasshoppers in my garden. They are chewing up the leaves on my parsley, sunflowers, oregano and pretty much everything. Now they are eating the flower buds off the coreopsis which seems to be a favorite of theirs. As I walk along the edge of my small garden area, they jump away from me in a wave of moving leaves. There are a lot of them. I am an organic gardener, so I’ve been searching for natural ways to get them to leave, or die. The organic product (Semaspore Bait) that kills them, is best used when they are young, so I don’t know if mine are young enough. Even a small container is quite expensive, and since I don’t know if it will work at this time, I’m hesitant. I’ll look for it at Agway. 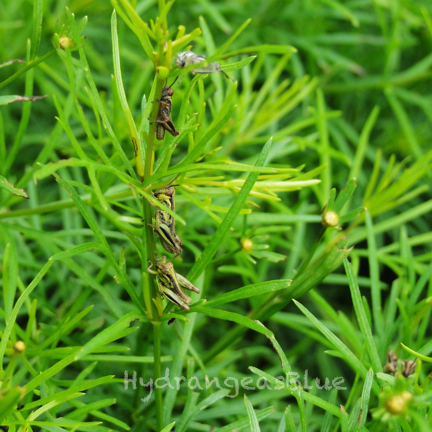 A post at Home Guides has given me some advice for keeping the pests off my leaves naturally. I know that garlic spray works well for insect control, but I don’t want my herbs to taste like garlic. I might use it on plant leaves I won’t be eating. I am going to try the molasses in jars approach. By mixing molasses with water, the sweet drink attracts grasshoppers. I have lots of little canning jars which may work for this experiment. The idea is to attract the grasshoppers to the liquid and then they drown. I have to bury jars in the dirt and fill them halfway with the mixture. I hope it doesn’t attract beneficial bugs as well. I’ll keep an eye on it. Since I have molasses, and lots of canning jars, I plan to get started on that right away. I’ll let you know how it goes. I might combine that with the garlic spray approach and between the two, I may have some success. There is no way I can kill them all within the short span of summer. I’d love to have more birds, toads, frogs and even snakes around to chow down on the little critters. I’ve seen some toads, and even a frog. But my cats tend to keep everything away. I only feed hummingbirds in summer because of the bears in my area. The smell of sunflower seeds can bring bears into the yard, and I’ve had them destroy my feeders when left out in summer.